Immediate Full Dentures - Prior to having your teeth removed, your dentist takes measurements and has dentures fabricated for your mouth. After removing the teeth, the dentures are immediately placed in your mouth. The benefit is that you do not have to spend any time without teeth. You will, however, need to have follow up visits to refit your dentures because the jaw bone and gums will change shape as your mouth heals. The dentures will need to be tightened after the jaw bone has healed. Partial dentures are another option when not all of your teeth need to be removed. This is similar to a bridge, but it is not a cemented fixture in your mouth. Even though dentures are not real teeth, they still require your care and attention. You should brush and/or soak them to remove plaque and food particles. 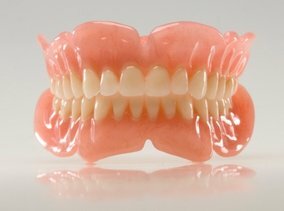 Your dentures are fragile, so make sure you are careful when handling them. They may be slippery, so don't drop them! Also, never try to adjust your dentures yourself. You could ruin them, so you should always seek assistance from your dentist if they feel uncomfortable or loose.